Mortise Lock should be as per ISI: 2209- 1976. The metal case containing the operating parts of the lock set in to a mortise cut in the style of the door shutter is called mortise lock. This is the hidden lock only key hole is visible from outside. These are of two types i.e. Single cylinder lock and double cylinder lock. Single cylinder lock is operated with a key from the outside and without key from inside. But this have disadvantages that if any intruders come in the house through window etc. he can easily escape from the house by opening the lock. Double cylinder lock is operated both side with a key. Double cylinder locks offer better protection; if a burglar enters the house through a window, he or she cannot open the door without a key. Mortise lock is a metal case containing the operating part of the lock is set in to a mortise cut in the style of the door. Locks for internal and external door, where security is consideration, consist of a latch bolt and a lock bolt. For internal doors in continuation use, the lock contains a latch bolt only to keep the door closed. They are horizontal mortise locks and vertical mortise locks. The two bolt mortise lock consists of a case, a face, striking plate and lock assembly i.e. handle or knob, dead bolt and keys etc. The lock is made with a case plate that is screwed in the position flush with the edge of the door or finished with the face plate of brass which is free from any rivets to improve the aesthetic appeal. The size of lock is measured as overall length of the body from the outside face of the front to the rear end. 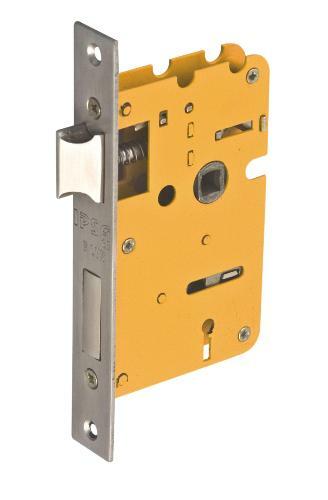 The common sizes of mortise locks are 65, 75 and 100 mm. The clear depth of the body shall not be more than 35 mm. The lock is capable of being opened with key from both inside and outside. When slot or recess for fixing mortise lock is prepared, sufficient thickness of shutter should be left on both side of slot to hold the lock properly and strength of shutter should not be reduced. 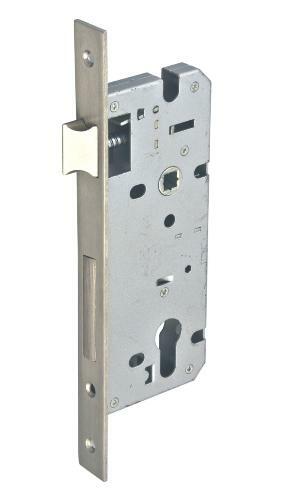 As the thickness of mortise lock is 15 mm so keeping in view of this, the thickness of the shutter required for fitting the mortise lock should be less than 35mm. Latch bolt should have minimum size12x16 mm for all sizes of locks. It consists of a latch bolt, latch spring follower. Follower has a square hole at the centre to accommodate the spindle of the handle, which operates the latch bolt. When the spindle with handle is inserted in to hole of follower and turned, the latch bolt should draw smoothly in to lock body. When fully pressed, the latch bolt should not project more than 1 mm from the face of fore end i.e. from face plate. The striking plate has two rectangular slots and it is fixed in the mortise cut of door frame in the alignment of the mortise lock (already fixed in shutter) to house or hold the locking bolt and latch bolt. The plate is termed as striking plate, as it serves the purpose of directing the shaped end of latch bolt in to the plate as the door is shut. It has two countersunk holes for fixing it to door frame. Locking bolt is of 8x25 mm section for all sizes of locks. The minimum throw of the looking bolt should be 12mm. In the withdrawn position, it shall not be project more than 1 mm from the face of the fore end. The locking mechanism is ordinary lever type with not less than two levers. The action of the locking bolt when operated by key, should be smooth and without impediment and it should be positively locked in the forwarded position after completion of the key rotation. 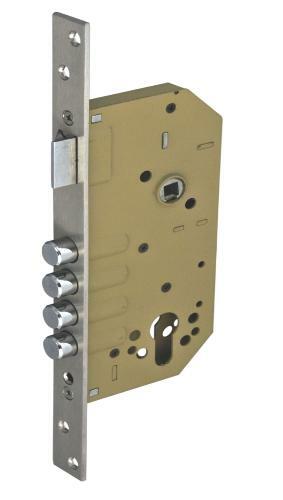 The latches should be as per (IS; 5930-1970) and be operated both from inside and outside. They are provided with a thumb turn knob fitted on the handle, in order to close the door from inside while the compartment is in use. Mortise latches are generally used on bathroom, W C doors and doors to private rooms and do not have the arrangement of key for locking. The locking bolt turns into locking position when the thumb turn knob is turned through 90 degree. Door handle should be as per (IS; 4992-1995)for use with mortise locks either handle type or knob type. 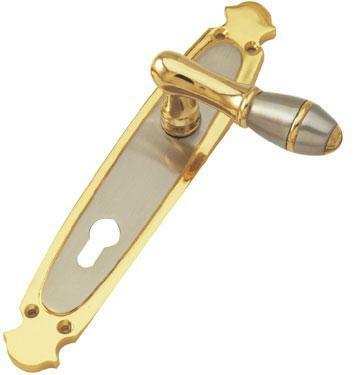 Door handle is normally of cast brass having 2mm thickness or brass or aluminum alloy sheet with 1.25mm in thickness. The connecting rod of made of milled steel shall fit correctly both in follower in the mortise lock and in the socket of the handle and shall work positively in combination with the follower. Edges of door handles should not sharp. To fix mortise lock in the door shutter frame is a skillful job so a skilled carpenter is required for this job otherwise there is a chances of breaking the style of door shutter. To make recess in the frame of shutter a mortising bit and router is used by the carpenter. The other method adopted by the carpenter is to make drilling into the door frame with a large drill bit and straightening the slot/ recess. The mortise lock is then inserted into the frame of door shutter. 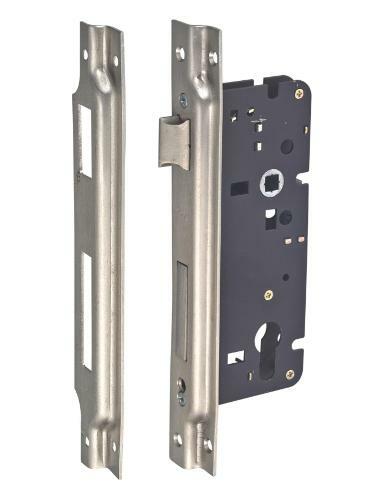 After making correct position of lock, the face plate is installed over the lock similarly the striking plate is inserted into the door frame and level with the bolt. Key hole and other hole for door knob or handle is prepared/ drilled in the door shutter. The key and handle holes are prepared in both side i.e. in the inside and outside so that the lock is used both side. 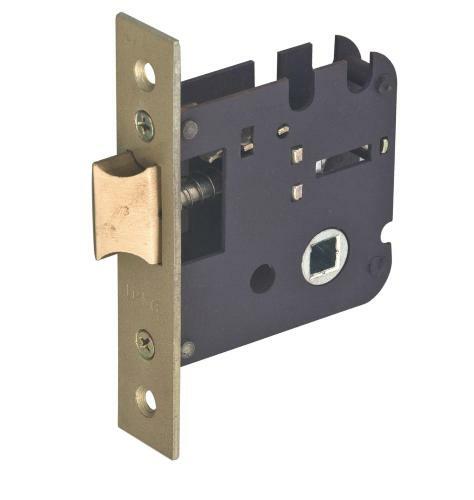 A mortise lock requires the use of a latch and handle/ knob system. The handle or door knob that one pulls or slide the latch bolt back and open the door. With the uses of key the locking bolt should positively be locked in the forwarded position after completion of the key rotation, otherwise the latch will slide back whenever the handle is pulled or turned. To set the dead bolt, most mortise locks require a simple twist of a knob inside. A cylindrical tumbler and key can be used to slide the bolt back from the outside. Security locks are very significant for home security to avoid burglary and cases of thefts. These locks are first line of defense against intruders whether one lives in a house or in an apartment. Know more about various types of security locks.